King Abdullah Specialized Childrens Hospital is designed as three 11-story towers spanning over an area of 192,000 m2 with a capacity of 542 beds. The design of the hospital has enabled the creation of a four floor podium, with three (3) towers rising from the podium, accommodating all inpatient beds, intensive care units, as well as the play areas and family resource centers. 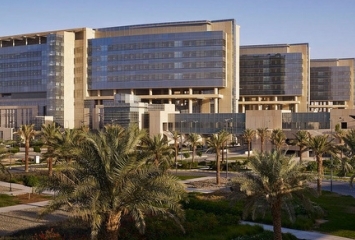 The hospital accommodates all pediatrics needs, providing superior medical care and distinct 364 single en-suite pediatrics patient rooms distributed as follows: 40 beds for the Intensive Care Unit, 48 beds for cancer and bone marrow transplant patients, 8 beds for Psychiatry and 4 beds for the burn unit. The hospital is also considered an integrated medical facility which will include several vital sections and therapeutic units such as a fully equipped ER Department which will accommodate 57 children's exam rooms as well as a 30 bed-capacity Surgical Day Treatment Unit. Moreover, the Radiation Oncology Unit has a 20 bed capacity equipped with the latest advanced technologies. Additionally, 8 beds are allocated for Hemodialysis. As for the operation rooms, 16 rooms are equipped with the latest surgical technology in addition to 30 exam rooms for the surgical department. Regarding the Outpatients Clinics, 61 exam rooms will cover the treatment of various diseases and disciplines. The Medical Oncology and Hematology Unit has 39 rooms, 14 of which are exam rooms and 25 used for chemotherapy. The third tower has been allocated as a fully equipped specialized center for Adult Organ Transplant services with a capacity of 178 beds distributed as follows: 100 beds for cancer patients and 78 beds for transplant surgeries. VIP suites (6) and 12 beds are available within total bed compliment. All patient rooms are single occupancy with en-suite facilities and sofa bed for parents / relatives. Each Paediatric ward has dedicated classrooms and playroom facilities. The Hospital will likewise provide comprehensive tri-modality cancer treatments, in terms of surgery, chemotherapy and radiation therapy - related Cyclotron is located directly on Hospital campus. Dedicated Clinical Specialty Ambulatory Clinics are provided so as to enable necessary periodic assessment and treatment of attending patients. As an Academic Teaching hospital there are On-site Conference Rooms, Lecture Halls and Library facilities.